Members of the Grays Harbor Genealogical Society, a hearty bunch for sure, are picking themselves up by their boot straps and putting together a plan to restore their Research Library. The library was destroyed in a 3-alarm fire on Saturday, June 9, 2018. Besides the research library, the fire at the Aberdeen Amory also devastated the Aberdeen Museum of History, Coastal Community Action and the Aberdeen Senior Center. The cause of the fire is still under investigation. Click here for next day news coverage by the Aberdeen Daily World. A temporary location at the Hoquiam Regional Library has been secured. 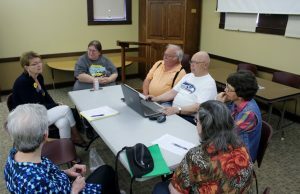 Under the leadership of GHGS President Gary Parfitt and a small committee (of a small society), plans are being made to purchase everything from computers and a copier to pencils and paper clips. Generous financial donations from local genealogical societies and individuals from around the state have been humbly accepted. In addition, many societies have offered donations of Grays Harbor-related books and family researches. GHGS is particularly interested in early Polk Directories, telephone books, obituaries, funeral records, identified photographs or family histories (with ties to Grays Harbor or Chehalis Counties). Anyone with materials to donate or reproduce can contact Gary Parfitt at gjparfitt@msn.com. Financial donations can be sent to the society’s Research Library Go Fund Me page or directly to the Grays Harbor Genealogical Society, P.O. Box 916, Aberdeen, WA 98520.